Welcome to the Village Council's web site. You can find information on our community and its environs, where to stay, where to eat and where to shop. 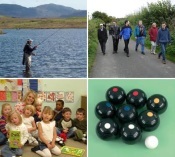 You can also find information on what's on in the area through our calendar and much more. 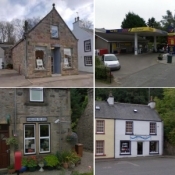 We hope you enjoy our web site and our beautiful corner of the Speyside valley. Craigellachie has two art galleries, Leap Gallery and the Greenhall Gallery, two distilleries and is home to the Speyside Cooperage, the only working cooperage in the UK where you can experience the ancient art of coopering. 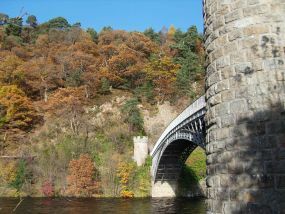 Craigellachie Bridge over the River Spey was built by Thomas Telford in 1814. The bridge is a remarkable piece of engineering, and can be viewed from above or below. The bridge was chosen for the last parade of The Gordon Highlanders and The Queen's Own Highlanders before the were amalgamated in 1994 to form 'The Highlanders'. 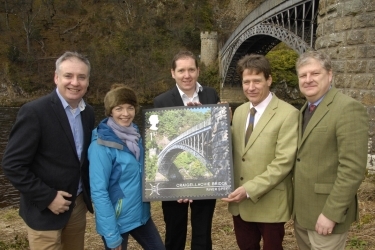 Craigellachie Bridge is also a licenced wedding venue and has already had several ceremonies performed on it. To promote the benefit of the Craigellachie and environs without distinction of political, religious or other opinions, by association the inhabitants, voluntary organisations and local authorities in a common effort to advance the education and to provide facilities in the interests of social welfare for recreation and leisure time occupation with the object of improving the conditions of life for said inhabitants. To administer and maintain funds and properties formerly belonging to Craigellachie Association, the Craigellachie Public Hall and the Craigellachie Playing Fields Association. Click here to read about the Play Park Success. Here you can find web links and phone numbers for airports, train stations, buses and taxis to help you get around the area. You can use the journey planners to find routes and times on public transport and to plan your own car journeys from door to door. 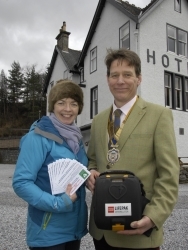 The Aberlour & Speyside Rotary club raised funds for a defibrillator for Craigellachie. The defibrillator is located in the reception of Craigellachie Hotel. The leaflets being held have been distributed to every household in Craigellachie to let them know about the defibrillator. There is also an instructional DVD for individual and groups to use. However it is stressed that the defibrillator units are easy to operate and are self explanatory . In this section are many telephone numbers that you may need and find useful. John Street, Craigellachie, AB38 9SX. The school itself is situated in the village of Craigellachie, overlooking the River Spey. Formal education has been provided here since 1870 and in our present building for over 100 years. Although a listed building, the inside has been modernised and equipped to meet the needs of today's curriculum. This has also been helped by our extra accommodation in the playground, which provides a P6/7 classroom and a room for expressive arts. Our accommodation has been enhanced by the addition of the Spey room. This room provides a quiet teaching and learning area for individuals and small groups. We are continually developing our grounds to increase opportunities and facilities for learning, socialising and relaxing. At the moment the Village Hall, local amenities and Speyside High School are used for a variety of curricular and social purposes. 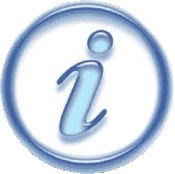 You can find information about local businesses in this section plus links to their web sites. please contact The Village Council using the contact form in the main menu at the top of the page. A minimum donation to The Village Council is required. John Street, Craigellachie, AB38 9SW. Built on a site overlooking the River Spey as a mission church from Aberlour. A simple T-plan church with Gothic details built in the local pink granite with a slate roof. Inside, a traditional layout with the pupit in the centre of the long wall. A meeting room was constructed in 2002 and provides a useful resource. Originally dedicated to St Drostan, the church was built in 1812. The neo-Norman tower 1840 by William Robertson, architect, Elgin, was the sole survivor of a disastrous fire in 1861. George Petrie, architect, rebuilt the church in neo-Norman style. Choir added 1933 by J Wittet in memory of Sir James Ritchie Findlay. First organ by Brindley & Foster 1900, rebuilt by Ernest Lawton 1932, and present organ rebuilt by Sandy Edmonstone 1991.